Omikuji (sacred lot) are fortunes written on rolled strips of paper. You can find these at shrines and temples throughout Japan. The traditional way of receiving an omikuji is by taking a bamboo container that’s filled with small sticks, and shaking it until the first stick falls out. Each stick is numbered, and a priest or priestess will then select an omikuji that corresponds with the numbered stick that has fallen from your bamboo container. Nowadays, it’s more popular to make a small donation (usually a coin) to the shrine or temple, and then randomly draw an omikuji yourself. Omikuji vending machines are also popular. The omikuji have fortunes that bring everything from wonderfully good luck (大吉) to terribly bad luck (大凶). If you’re not fortunate enough to get a lucky omikuji, then you should leave your strip behind. Traditionally, unlucky omikuji are tied to the branches of a tree, where the bad luck will (hopefully) stay instead of following whomever drew the strip. A good fortune, however, is supposed to be kept with you in a coat pocket or purse. This is believed to be a cat-shaped good luck charm for business success. A cat with its left paw raised welcomes people and guests, while a cat with its right paw raised welcomes money and fortune. There are different stories as to where the beckoning cat (maneki neko) originated from, but most agree that the statued feline was introduced sometime in the Edo period (1603 – 1867). One of the most popular stories of the beckoning cat’s origin is the story of when the second head of the Hikone domain, Ii Naotaka, was passing by Goutokuji temple. As he was passing he saw a cat beckoning for him, and followed the feline into the temple when it suddenly started to rain. Lightening hit the trees and gates surrounding the temple soon after. Naotaka believed that he narrowly escaped falling victim of the lightening, and to express his gratitude, his family shared some of their wealth by joining Goutokuji temple. At the time, Goutokuji temple had been poor, but quickly became rich thanks to Naotaka’s family’s help. The cat was then dedicated to the temple as a symbol of good luck. Some argue that the real beckoning cat appeared in Kyoto with a geisha as its owner, while others believe that the beckoning cat brought fortune to passersby at other temples throughout Japan. Many of these temples still stand today. Goutokuji in particular greets its visitors with hundreds of white maneki neko. Beckoning cats also carry different items in their paws. Many of the cats are dressed with a collar, bell, or bib, as these were popular accessories to dress family pets in during the Edo period. It’s common to find a maneki neko holding a gold coin called a 小判 (koban: used in the Edo period). Other maneki neko can be seen with mallets that attract wealth, a fish that symbolizes good fortune, or other accessories. It’s thought that shaking a maneki neko with a mallet promotes even more wealth. Consider trusting your pennies with a maneki neko next time you’re on the lookout for a new piggy bank. 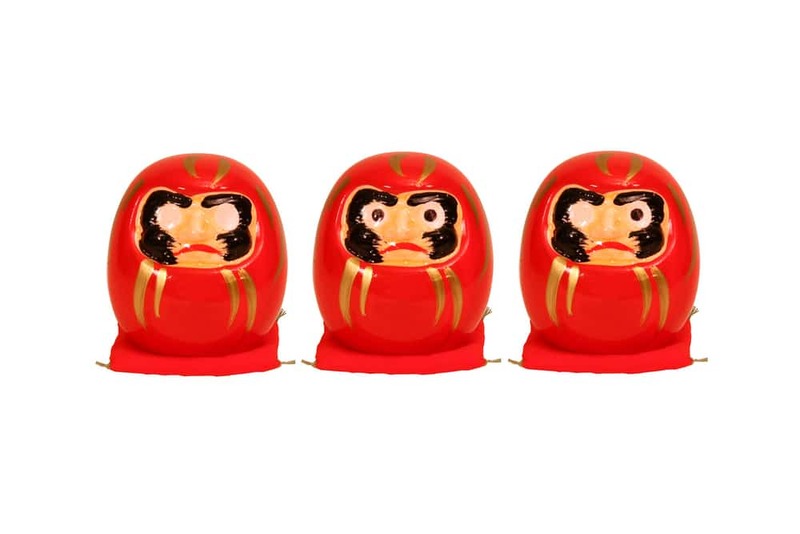 The Daruma Doll is a good luck charm that’s used to wish for something. People paint the left eye first and make a wish, and paint the right eye after the wish comes true. Like many charms, the color of the daruma doll varies depending on what someone is wishing for. The doll itself is made of paper mache and is weighted on the bottom. It’s believed that the doll brings good luck and even encourages others towards their goals because no matter how many times you push it over, it will resume its upright position. You can even see candidates using a daruma doll to help them in upcoming elections! Daruma doll festivals are held each January, where anyone can see and buy a great variety of daruma dolls throughout Japan. Perhaps the most famous place to see daruma dolls is Takasaki City in Gunma Prefecture, where most of these dolls are made. If you’re not in Japan during the winter months, visitors can also see hundreds of daruma dolls year-round at the Daruma-ji Temple in the city of Takasaki. Many of you have probably seen pictures of ema already! If you’ve visited a Japanese shrine, then you might have written a wish on your very own ema. “Ema” is a combination for the words “picture” (絵) and “horse” (馬). 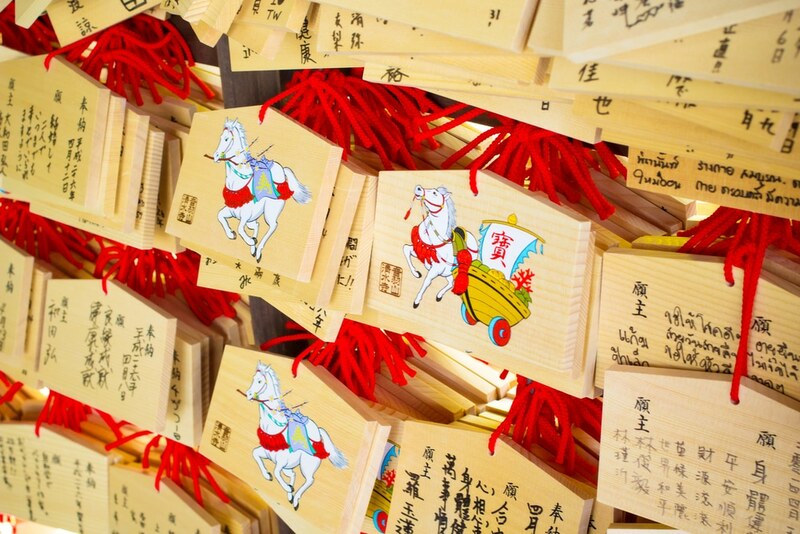 Ema are wooden plaques that are used to carry wishes. One can write their wish on the back of any of these plaques, and it’s believed that your wish will be delivered to a god! Horses were thought to be the transportation for the gods. People would donate their horses to shrines so that the gods would be more likely to hear their prayers. Ema became a good luck charm to replace the offering of a real horse for those who could not afford to donate an actual horse. The front of an ema usually features a picture of a horse, and a wish can be written on the back. The tradition still holds strong, and nowadays you can find ema in all shapes and sizes at most shrines. Although traditionally ema feature a horse, one can also find the wooden plaque shaped into your favorite cartoon character, cherry blossoms or hearts. Some ema don’t feature any picture on them, so those who’d like to be creative can create their own. Ema can be bought at a small booth at the shrine, or sometimes you are given the choice of making a small donation in a box next to the ema before you make your wish. Many anime fans or fans of all things cute have probably seen these features at some point or another. 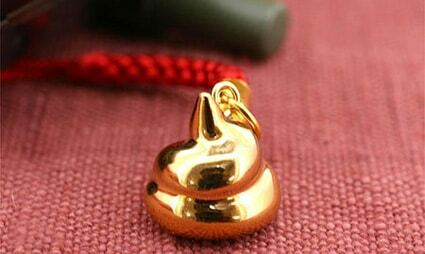 Although not a traditional good luck charm, the golden poo has made its way into Japanese society with welcomed arms since its debut around the year 2000. The Japanese word for “lucky” (うん：運) looks similar to the Japanese word for “poo” (うんこ), so lucky poo is more of a pun than anything. The original company that manufactures these trinkets use porcelain and coat each ornament in gold. A small version sells for a little over 100 yen while a larger poo will cost just over 2000 yen. You can also find these trinkets sold as cell phone charms, key chains and even replacing balls in baseball mitt key chains. If you’d like something a bit cuter, then golden poo can be found in a variety of different colors with adorable faces drawn on them.